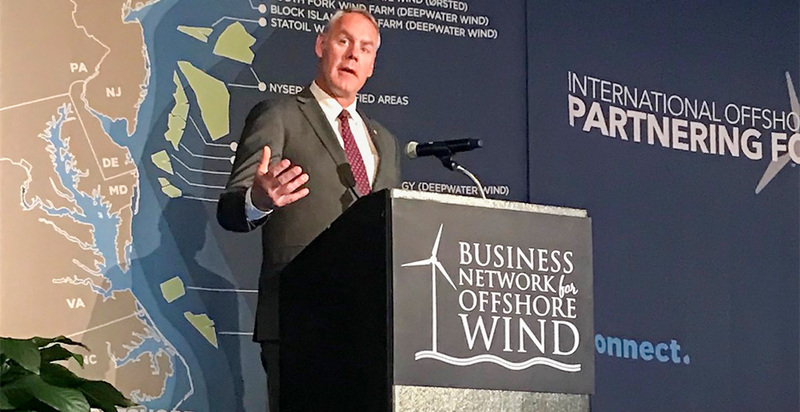 In April, Interior Secretary Ryan Zinke came to an offshore wind conference in Princeton, N.J., to give remarks on "energy dominance." It was a charged moment to be giving the speech. Three months prior, the Trump administration had proposed to open 90 percent of federal waters to oil and gas leasing. Zinke had offered to exempt Florida, prompting an outcry from liberal Northeast states like New Jersey that wanted to move away from fossil fuels. What Zinke said, to many raised eyebrows in the audience, was that offshore wind, just like oil and gas, fit into the "energy dominance" framework. He said if a state chose wind, it had a friend in the White House. One audience member said the tone was "almost apologetic." "Of the current energy portfolio, probably wind has the greatest opportunity for growth," said Zinke. "Let's make American energy great. Let's make sure we make wind energy great." One could easily have imagined a different tone. Zinke, after all, worked for an administration that has cast doubt on climate science, rolled back Obama-era regulations on carbon pollution, and worked to subsidize coal and nuclear plants. Offshore wind, after more than a decade of development under Presidents George W. Bush and Obama, could hardly have been a juicier target. The young industry hadn't yet found a footing in the U.S., and it will need heavy subsidies to get started. For the Northeast states advancing it, most of which had sued over Trump's climate policies, climate wasn't a side issue; it's the point. But instead of following the same pattern of conflict and lawsuits, offshore wind is on the brink of arrival. A year and a half into the Trump administration, with upheaval all around the U.S. energy world, offshore wind is benefiting from an oddly cooperative dynamic between states and the federal government. The projects envisioned under Obama are moving toward fruition, and if trends hold, the U.S.'s first utility-scale offshore wind project could be under construction by the end of Trump's first term and operational in 2021. In Maryland and Massachusetts, regulators have approved financing for two installations of 368 and 800 megawatts, respectively. New Jersey and New York are laying the policy groundwork for 5,900 MW more. California, Connecticut, Delaware, Rhode Island and Virginia are exploring projects and policies of their own. It's happened not despite, but thanks to, the help of the U.S. government, offshore wind advocates admit. "Yeah, I can't explain it myself," said Nathanael Greene, director of renewable energy policy at the Natural Resources Defense Council. "I think as a whole, this administration has a lot of people that are probably not actually anti-renewable as much as 'all-of-the-above' advocates ... [t]hey don't care about the environmental aspect of it. That's not what's driving them. But this is [potentially] a big American industry." "I think the administration rightly sees offshore wind as a power source that can help us achieve energy independence and security ... and also dominance in the global economy," said Stephanie McClellan, director of the Special Initiative on Offshore Wind at the University of Delaware. "I don't want to say it's not a surprise, but it's fitting." On Nov. 8, 2016, the day Trump was elected, many friends of offshore wind had their doubts. During the Obama administration, Catherine Bowes, program director for offshore wind at the National Wildlife Federation, had spent years advocating to open up U.S. waters to the industry. With large-scale wind farms going up off European shores, the Obama administration leased more than a million acres of federal waters as potentially eligible for the same. Supporters of the industry expected the next step to occur under a Hillary Clinton presidency: proposing, and ultimately building, real projects. Instead, the president-elect was Donald Trump, who had sued to block a wind project visible from a golf course he owned in Scotland. "I want to see the ocean, I do not want to see windmills," he said in 2006. "Oh, my god, this is game over under the federal administration now," Bowes remembered thinking that night. "We've worked so hard to get to this place, and now we need them." If Trump had wanted to crush offshore wind, he would have had plenty of options. Wind turbines do not end up in federal waters trivially; they result from a plenitude of federal and state approvals. It can take years just to set up the conditions for an offshore wind developer to lease an area — and, once it has, five to seven years before there are windmills in the water. The Bureau of Ocean Energy Management, which is in the Interior Department, is the lead office in charge of the federal permitting. But throughout the permitting process, many other offices get to touch the ball, including EPA, the Navy and Coast Guard, the Army Corps of Engineers, the Federal Aviation Administration, NOAA, and the Fish and Wildlife Service. And before building a project, a developer must get federal approval for a host of highly regulated activities, such as measuring wind and water conditions at the site. When the company's ready to build, its plan goes through a full environmental review under the National Environmental Policy Act. As some in the offshore wind business observe, it would have been easy for the Trump administration to barricade the regulatory process, whether by denying permits or just stalling. That might have "killed the industry in the cradle" by casting doubt over the process, said one lawyer with offshore wind clients. Instead, it appears the Trump administration has been attracted to offshore wind not for the reason states like it — climate — but because it fits their brand of "energy dominance." "The assumption was that they weren't for it. My alternative posture back to you would be that I think that they looked at it through the lens of American energy," said Jon Hrobsky, a policy director at Brownstein Hyatt Farber Schreck and former Interior official under the George W. Bush administration. "If you're only willing to look at offshore wind through the lens of climate, then I understand [that assumption], but that's not how this administration appears to be approaching it." The proof is in the regulatory pudding. 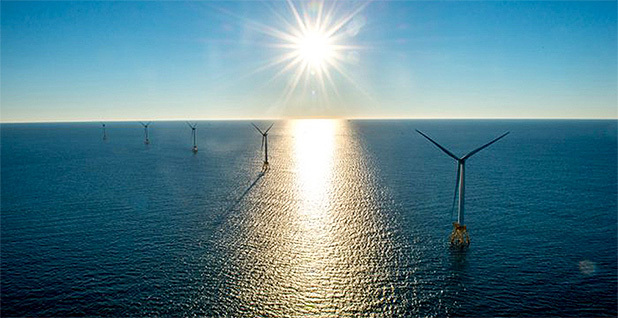 In March, the companies behind Bay State Wind, a 400-800 MW installation proposed for Massachusetts waters, said the project was the first-ever offshore wind project to receive "FAST 41" status — a special designation meant to accelerate the federal permitting process. Bay State is a joint project of Denmark-based Ørsted, the largest developer of offshore wind in the world, and U.S. utility Eversource Energy. And in June, an Interior royalty committee suggested that Interior direct its wind leasing program to deploy at least 20 gigawatts of offshore wind — beyond what's currently on deck — by 2024 (Energywire, June 7). It is unclear whether the Trump administration had this position from the start or whether it evolved into it. Either way, it seems that Denmark, which has 1.3 GW of offshore wind, played a part. 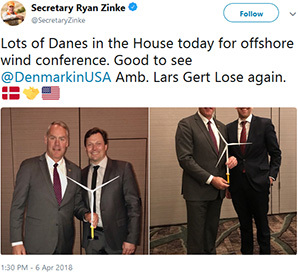 According to Zinke's public schedules, in October of last year, he met with the Danish ambassador to the U.S., Lars Gert Lose, and Dong Energy, a Danish company that once focused on oil and gas but has become the largest developer of offshore wind in the world. (Dong, which has since changed its name to Ørsted A/S, has developing projects in Massachusetts, New Jersey and Virginia.) Later that month, Zinke met with Denmark's energy minister, Lars Christian Lilleholt. In January, Zinke released a plan to open up 90 percent of federal waters to oil and gas leasing. Coastal states revolted, saying Florida had been unfairly exempted and demanding the same exemption. In New York, Gov. Andrew Cuomo (D) said if oil explorers came to its coast, he'd lead a flotilla of boats to block them (Energywire, May 7). With the controversy brewing, Zinke's counselor for energy policy, Vincent DeVito, traveled to Denmark for a two-day "fact-finding" tour focused on offshore wind. "We exchanged best practices for leasing and flexible permitting," DeVito said in an email to E&E News. Less than three months later, Zinke was in New Jersey touting offshore wind, not for climate reasons but as a nascent industry that could produce jobs and infrastructure in America. He followed it up with an April op-ed in the Boston Globe that said offshore wind "will play an increasing role in sustaining American energy dominance," and he elaborated further in a June interview with the Washington Examiner. "When the president said energy dominance, it was made without reference to a type of energy," he said. "It was making sure as a country we are American energy first and that includes offshore wind. There is enormous opportunity, especially off the East Coast, for wind. I am very bullish." Many offshore wind advocates admit to being pleasantly baffled by this bullishness. But they have ways to make sense of it. Some note that offshore wind hits the alpha-male notes of Trumpian "dominance," with its need for manufacturing, steel, concrete, ports and power lines. Others observe that while offshore wind requires subsidies, it's the states, not the federal government, that actually have to produce most of the money. Dan Kish of the Institute for Energy Research, a think tank with ties to the Koch family, is no advocate for the industry. Still, he said, if states want to raise their own citizens' electricity bills, the Trump administration might not want to get mixed up in it. "If [states are] choosing to spend more on electricity deliberately as a result of policies, I don't think the administration is necessarily going to stand in their way," he said. "Sometimes you let the child touch the hot stove after repeatedly attempting to get his attention." Proponents fire back that costs are falling, thanks to projects in Europe. Last year, Dong won an auction in Germany with a project it claimed would require zero subsidy. Developments like these have encouraged Northeast states that the industry's cost promises are credible; Massachusetts' legislation requires project costs to fall over time (Energywire, Dec. 15, 2016). Another potential draw for Trump: the connection to Big Oil. As many observed, offshore wind opens up business opportunities for companies that can build infrastructure in deep water. Putting up a turbine means drilling into the ocean floor, laying down a massive foundation and managing logistics on the rolling waters the whole time — core competencies for companies that work in the U.S. Gulf of Mexico. "There's a lot of big corporations that are interested in offshore wind," said Joe Martens, director of the New York Offshore Wind Alliance. "The same businesspeople that they are logically sympathetic to are in the offshore wind space." And in some places, it's already making the federal government money. In December 2016, the month after Trump's election, Statoil ASA (which has since changed its name to Equinor ASA) paid the federal government more than $42 million to lease waters off the Long Island coast. The company estimates the site could accommodate a gigawatt of offshore wind. Royal Dutch Shell PLC, which is a partner in developing a project off the Dutch coast, has expressed interest in New York, as well. If offshore wind is indeed emerging as a major business interest, there's a telltale sign in Washington: lobbying. Last year, Republican Rep. Andy Harris of Maryland tried to slot language into a budget bill to cut off agency funding for projects proposed to go up within 24 nautical miles of Maryland. That prompted an opposition letter from the National Ocean Industries Association and the American Wind Energy Association — the lead groups representing the offshore oil and wind industries. The language was cut from the final budget bill. But as veterans of the offshore wind world know, it's too early to declare success. A single tweet could always throw the industry into disarray. And in the coming years, the industry will be dependent on the federal government in two key areas: opening up more water for development and approving the projects already proposed. BOEM is currently managing 12 active commercial offshore wind leases. At a congressional hearing last month, James Bennett, chief of BOEM's renewable energy office, said the program can currently fulfill its "primary objectives" — managing these leases and creating new leases — despite proposed budget cuts for BOEM. Down the road, he said, "Some of those activities will not happen as quickly if we don’t have the resources to pursue them." In a worst-case scenario, one offshore wind consultant said, the administration could take years to evaluate a project's construction proposal, only to reject it. "Shhh," said the consultant. "Don't jinx it."